Rail investment can play a vital role in the growth of any economy, and Kent and Medway is no different. 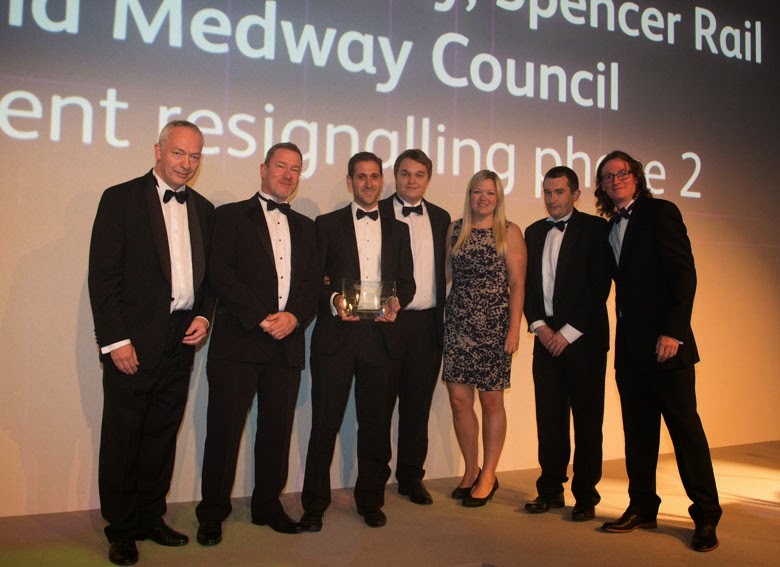 The role played by Medway Council in delivering the £150 million rail improvement programme of works on East Kent Phase 2a has seen it celebrated in Network Rail’s 2014 Partnership Awards. The partnership, described as an industry model for a collaborative project, saw Atkins, Balfour Beatty, Spencer Rail and Medway Council working together to deliver the East Kent Phase 2 project. The work includes signalling renewal, platform extensions to accommodate 12 car-trains and a new station, within a limited timescale. The award was given in recognition of the partners working with Network Rail as one solutions-driven team and thanks to implementing innovative delivery approaches and achieved engineering savings while providing a successful solution. The council, and partners, were presented with the Collaboration Award by Jeremy Candfield, director general of the Railway Industry Association.